I cannot believe it has been two years already. 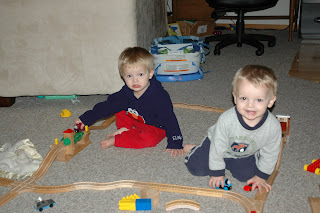 Two years of life with twins, two years that these precious boys have been a part of our lives. However, it is even harder to believe it has only been two years since I only had one child, since laundry could be done on the weekends, since I could run into the grocery store without spending an hour in the parking lot organizing kiddos, breaking up fights, and buckling carseats. Anywhoo, back to the boys. 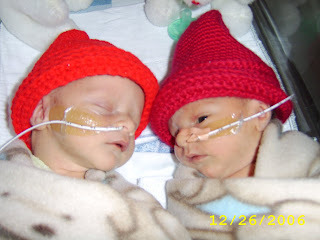 Two years ago today, they entered the world three and a half weeks early, but in a huge hurry. Here's the story. I woke up at the usual time of 7 am when Marty's alarm went off. I needed to pee (of course) so I stood up and my water broke all over the bedroom floor. Marty's first reaction, "Did you really just pee yourself?" did not give me warm fuzzy feelings towards him. But after about three seconds I had to laugh, I couldn't help it. I changed, wiped up the floor and called the doctor, she said to get on in to the hospital fairly quickly, but not to stress. My contractions started around 7:45, we left the house and dropped Emma off at school and went in to the hospital. The thing is, I had called the doctor before the contractions had started, so the hospital was under the impression that I was coming to be induced, and not that I was in labor. They really were not in a hurry, I was finally put into a room and was told that a nurse would be in shortly. Twenty minutes later, I was writhing in pain on the hospital bed and Marty was in the hallway yelling at whoever would walk by, "Hey, can we get a little help in here?" The nurse showed up at 9:50, and was still not in a hurry. "Don't worry, sweetie, it will be a while." If I could have, I would have gotten up and strangled her, but I was in active labor and could not move around a lot. We tried to tell her that things were moving faster than expected, but she did not believe us, and kept moving at a snail's pace. She called the anesthesiologist and told me that he would be in in the next twenty minutes, and I replied that the babies would be here in the next twenty minutes. She gave me a look, one that showed pity that I would actually think that my labor could move that fast, with a condescending edge that said that she was the professional and knew better. She is still not on my list of favorite people. The anesthesiologist (thankfully) came right away, took one look at me and the monitors, and said, "We need to move!" Finally, someone who took us seriously! He tried to get the epidural in, but was only able to administer the little starter dose that will tell them if it is in the right place before I was whisked off to the OR. With twins, they automatically deliver in the operating room since there is such a high chance of an emergency c-section. On the way to the OR, I saw my doctor in the hall. I just remember feeling like the first baby was crowning, and telling her to hurry. She ran, and we were ready to deliver in no time. Grant was born at 10:21, all I got was a quick glance before they whisked him off. Ben came at 10:25, by breech extraction. I will spare you the details of a breech extraction, it's not morning-coffee reading material. 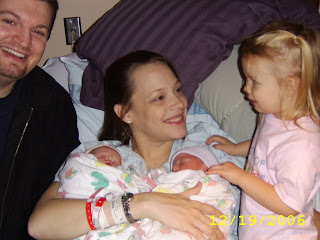 Anyway, just 35 minutes after the meanie-headed nurse first showed up in the room, I was a mother of twins. I learned later that they had to do chest compressions on Ben to resuscitate him, but after a couple of hours in the nursery to monitor his oxygen levels, I was able to have both my babies together. It is an interesting phenomenon to hold two newborns at the same time. The first day of life for a new baby is humbling in itself, the realization that God could create such a perfect little person and grow him up inside yourself is very humbling. Double that and I was in complete awe. Two perfect little boys, so incredibly different, and yet so the same. Their personalities were quite different from the get-go. Ben was a momma's boy, he responded well to me and demanded to be held most of the time. Grant was easy going and responded well to Marty, but when he was upset, he sure let you know. They wanted to be together all the time so we put them in the same little crib in the hospital, they were so used to each other's presence they would not have it any other way. They did well for the first two days, but then their prematurity started showing. They burned more calories eating than they were able to take in, so they lost too much weight and stopped eating altogether. They were admitted to the special care nursery to be tube fed. Ben had jaundice and had to be put under the Billi lights for two days, that was the first time they were not able to be together, but they were so worn out by then they didn't seem to notice. They spent a total of 11 days in the hospital gaining their strength, learning to nurse, and putting on weight. They were released on Dec. 30. It was heaven to have them home. That was such a difficult time for our family. Having the boys in the hospital over Christmas was devastating. Marty and Emma both had colds and were not allowed in the nursery, they were unable to visit for a full week. We managed to get through it with God's help, and now it has been two years. Thousands of diapers, thousands of dollars in baby food, and thousands of hugs, kisses, and loving moments. The newborn stage with the twins was incredibly hard, in the first six weeks the longest I slept was 40 minutes. By three months, I was able to log in a couple of hour and a half stretches, and they did not both sleep through the night until 15 months old. I have learned that God will give me what I need to survive, and I can do a lot more with a lot less than I thought I could. These boys are amazing, and I am looking forward to seeing their individual personalities develop. Happy birthday, Grant and Ben. I love you both so much and I am thrilled to be your Mom. I can't wait to see what the next two years bring! Family and friends, congratulations on your sons'/nephews'/grandsons'/friend's kids' birthday! Awwww Tiff I love labour storys... and boy you WERE quick!!!! Well I hope the boys, and you have a fantastic day. Happy birthday Grant and Ben. Happy Birthday Grant and Ben! Luvs and kisses from your favorite Aunty! As I sit here and read this, I am almost in tears! I so hope I don't miss this last one. I can't believe the emotion that I feel when reading this story. I love you boys!! Have a great birthday. I am sorry to miss it!!! Happy Birthday Bubbas!! I love you both so much and enjoy being your Daddy. Happy Birthday Grant and Ben! I did get to hold you when you were only a month old and you were just precious. What a joy you are to your family! Also I do like labor stories too and a woman who has had a baby should be listened too. Hope this next labor blesses you w/only kind hearted nurses who get you know what you are talking about.